Birthday: November 11, 1965 Height: 175 cm Weight: 67 kg Blood Type: AB Sidearm: Thompson contender in conjunction with his Mystic Code Origin Bullets Shirou's foster father and his savior from the aftermath of the massive Fuyuki fire. During his lifetime, Kiritsugu was disillusioned with becoming a Hero of Justice, a defender of humanity who could save everyone. Although he feels he failed to do so, his efforts were a source of inspiration for Shirou. 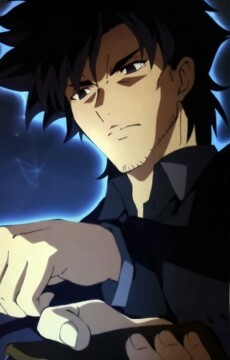 Prior to his fateful meeting with Shirou, Kiritsugu was notorious as the "Magus Killer," a freelancer who would hunt down heretical magi. Although he was a magus with Magic Circuits and abilities he was considered unorthodox in that he would utilize modern technology and weaponry along with his magecraft to track down and kill magi. Although mentioned and seen in flashbacks in Fate/stay night, Kiritsugu is one of the main protagonists in its prequel Fate/Zero. It is hinted at in certain parts of Fate/stay night and confirmed in its prequel Fate/Zero that Kiritsugu is in fact Illyasviel von Einzbern's biological father, making Shirou and her step-siblings.